I was so taken with this San Francisco prog-rock quartet’s 2013 second LP Violent Saga of the Ancients, that when their bio mentioned future plans to make a fantasy rock epic, I wrote (in my issue 72 review of Violent): “I’ll bet they have the passion and chops to pull it off.” Now with this third album representing the realization of that aforementioned aim, the band – consisting of former members of Thee More Shallows, Thee Druggles, and The Cubby Creatures – have turned me into a Nostradamus-like prophet. 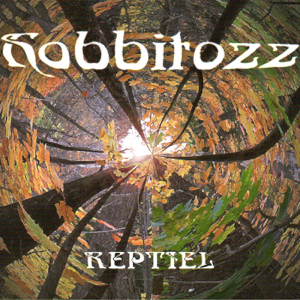 At nearly an hour in length, Hobbitozz is an ambitious rock opera/fairy tale, which the band claim is the “first in a multi-part series of psychedelic sci-fi/fantasy rock albums.” Given its title, it’s no stretch to assume that its storyline was influenced by J.R.R. Tolkien’s 1937 The Hobbit and L. Frank Baum’s1900 The Wonderful Wizard of Oz, both later made into popular films. The album recounts a recently orphaned boy’s travails while travelling through the forbidding, forested, and fungi-filled Hobbitozz in search of his fate, hobnobbing with a host of weird and whimsical woodland creatures along the way. But unless you’re a fantasy fable fanatic, or a Tolkien devotee, the parable’s prosaic plot is not as important as the musical presentation. Throughout, the album mimics a multitude of ‘70s musicians – from Rush to Pink Floyd to Led Zeppelin to Black Sabbath to Uriah Heep – who were intermittently inspired (directly or indirectly) by Tolkien works like The Hobbit and Lord of the Rings. But aside from a few harder-hitting numbers like the theatrical, Jefferson Airplane/Moody Blues-evoking “Near and Far,” the psychedelic, wah-wah and hand-tom powered “JackOh the Green,” and the lighthearted, loopy “Ecstasy in Shadow Green,” the LP is less punchy and propulsive than its predecessor, boasting plusher and more atmospheric production.